Just got unpacked in Manchester. I brought some food but mainly things for making yummy drinks. Celery, cucumber and watermelon juices as well as cherry and rhubarb syrup. Right now I am enjoying rhubarb and gin. 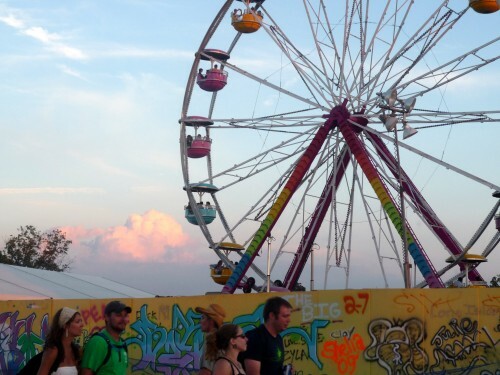 Posted in Uncategorized | Comments Off on @ Bonnaroo! 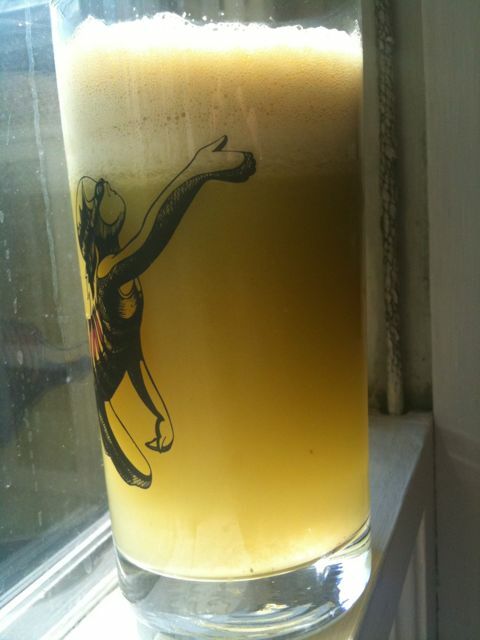 I made some cucumber, ginger, apple juice this morn. Everything was out of the fridge so it was cool and sweet and tangy! It is also possible that I was a bit hungover this fine summer morn and the juice seems to be doing the trick for that as well! Well it’s that time of year again in my life. Bonnaroo. It’s my fourth year at the festival and every year it takes over my life for a few weeks. While I would like to say there are tons of little local food gems in Manchester, there are only a few. I will blog about them as I eat there, stay tuned. Jiffy Burger and Praters are my top two. Y-U-M. I am hoping to make at least one field trip to Nashville; I have a short list of places to try. So blogging will happen when it can, more likely though, I’ll be tweeting. Sign up if you haven’t already @MbirdEvents. I’ve always wanted to make a clafoutis. Egg custard with fruit. Yum. Today I interpreted a Martha Stewart recipe. I didn’t want to make crust no do I have individual tart pans, oh and sour cherries are not in season now. 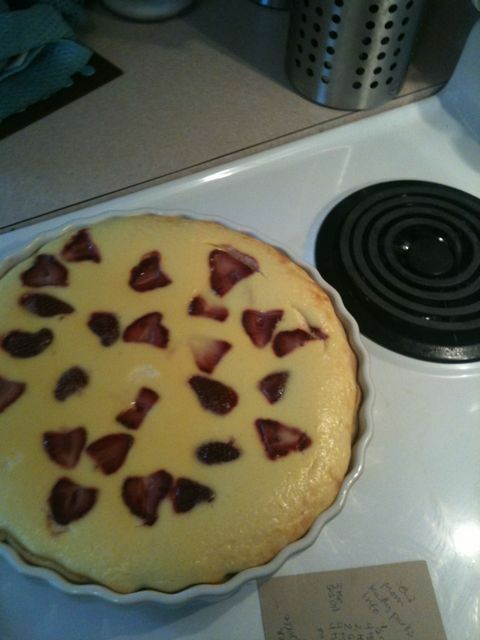 So I bought Pilsbury pie crust and stacked 2 layers into a 10″ tart pan, I added some eggs and homemade yogurt to make enough filling and bought strawberries from the farmer’s market. It looks and smells pretty darn good if I do say so! It took about 10 minutes to put together which is even better! Check it out. Two Bearden events that look awesome. The new chef at the Orangery is a Southern Foodways Alliance boy from Johnson City. His food is supposed to be amazing. Morgan Hartman of Vine Connections will begin by introducing her portfolio and discussing the wines to be served and suggested pairings, after which the event will guide itself, offering ample social opportunity enhanced by the classic rock & roll and blues sounds of Knoxville legends Mike Crawley and â€œDetroitâ€ Dave Meer as the Detroitdaddies. Posted in Uncategorized | Comments Off on Upcoming EVENTS! Last week I had to go to 2 grocery stores here in Knoxville to find Duke’s to make Bacon Pimento Cheese. Food City seems to be the only store to carry it despite the fact that it is the best and only mayonnaise you should buy and you can only get it in the south. The definition of mayonnaise according to food scientist Harold McGee, “Mayonnaise is an emulsion of oil droplets suspended in a base compost of egg yolk, lemon juice or vinegar, water and often mustard, which provides both flavor and stabilizing particles and carbohydrates.” According to the FDA mayonnaise is defined: as an emulsified semisolid food that is at least 65 percent vegetable oil by weight. The general selection of manufactured mayonnaise for us are Duke’s, Hellman’s, Miracle Whip, and Kraft. According to Cooks Illustrated from one of their mayo taste tests, the only major difference in ingredients of these manufactured brands is the vague, natural flavorings. They have a good taste test of mayo but the brands they chose aren’t available everywhere and they left off Duke’s.